Is there a muffin god? Because if there is… s/he doesn’t like me. Is there a crumb god? Because if there is… s/he doesn’t like me. My muffins came out dry as a bone and the crumb just melted into a mass of brown sugar gloppyness. To be fair, the dryness was my fault. I must have left them in too long or measured a bit too much flour. THAT, I can live with. But the crumb? what. the. hell?! Twice, this is TWICE now that my brown sugar crumble didn’t stay crumbly!! WHAT AM I DOING WRONG?? On the plus side, I think the baking gods winced a bit at the face I made and the loud bang as I pulled out the muffin pan and threw it on my stove top. I hope I scared ’em into submission because this is just… ridiculous! The flavor of these is amazing. I added cinnamon (naturally) and I doubled the recipe because this was SUPPOSED to be breakfast for all of us that were moving the next day. 12 big muffins for after dinner dessert at the future mother-in-law’s house and 24 mini ones for breakfast. It was all so perfect. Or so I thought. I didn’t even have the heart to ask anyone to try one. They weren’t horrible, I was just upset and pouting about my crumble. If you would like the recipe and a glimpse of what these are supposed to look like, visit Kayte at Grandma’s Kitchen table and oogle her other delicious goodies!! Click here for the recipe. Too funny! And no, there is no muffin god, but THERE is a MUFFIN GODDESS! LOL! And yes, they sometimes frown upon us, does we have to appease them. LOL! Mine did the same thing, the crumb tops wasnt crumb-y, instead, it was a mass of yummy carmal goop. But hey, the one’s in your picture look great, and they taste yummy, so WTH, right? Keep baking! I miss Texas, I used to live in Austin! lol – no crumble tips here, mine failed miserably as well. I will try to sub applesauce for butter next time. Your muffins look great! I should have added cinnamon as well. I kept my crumble in the fridge and patted it on the muffins pretty good before they went in the oven. I’m sorry about this one not working out for you. I had some trouble with the crumb topping, too. Well, they don’t look horrible…they look delicious. Sometimes the butter used is the culprit, I have found, because all butters have different water content and some are very high in water. I use Land O Lakes most of the time and have no trouble, but when I try to use some cheaper brands, I am always cursing and saying, “I am not buying bargain butter again!” And then a good sale comes along and I think, “Oh, it’s just butter….” and the cursing begins again. Let me know if you try them again and like the results better. I do think, however, that yours look lovely. Thanks for baking with me this week! Oh no, so sorry that these gave you trouble! I reduced the butter in the crumb topping a bit and made sure to keep it really cold before popping it in the oven. Also, I didn’t have much success with Dorie’s technique to cut the butter in. I thought a pastry cutter was more effective in achieving nice big crumbs! Hope you try these again – they were delicious. Please don’t misunderstand….. but, have you seen the sticky buns just before this post? OMG They look to die for. Yea, I know muffin are Not sticky buns. So hey, give it another whirl. I think these are really nice little muffins. Kind of gentle in flavor and crumb with a nice touch of brown sugary – ness. Oh no…muffin disaster! 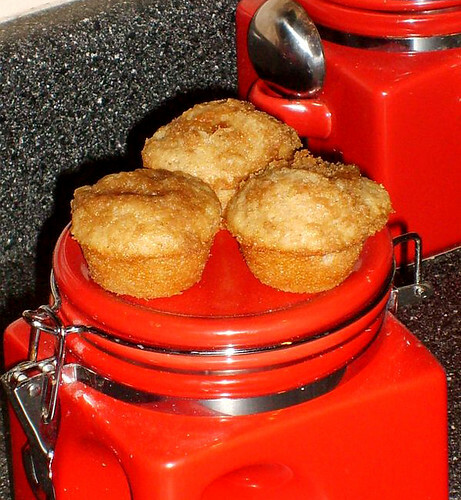 Wish I knew how to help – your muffins look great anyway! Sorry to hear that these were so frustrating! I had my crumble melt all over for another recipe. This time I used a really deep muffin pan and after they baked, the topping stayed on nicely. Someone mentioned tulip liners, which are like really tall muffin liners – I think those would accomplish the same thing as a deep muffin pan. Bummer! Well, my crumb topping certainly stayed on the coffee cake I made instead of muffins. I’d say it was the cold butter, but Chocolatechic used melted butter with great success, so I’m not really much help. I replaced some of the milk with buttermilk, which I think helps with moistness. Sorry about the crumb topping, they still look good! 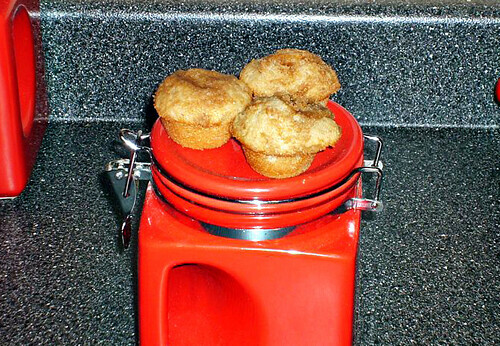 I am compulsive about checking muffins early so I don’t overbake, dry muffins are no fun. Sorry they didn’t work out: too true about dry muffins not being any fun, as Margot points out. Try again. They are worth it. Awwww, I think they still look delicious. I have trouble with crumbs too! They never look “crumby” enough for me. maybe try refrigerating the crumble? Warning- there is no logic behind this suggestion. Weeeellll, there’s always next week. The kitchen gremlins visit me, too. Your muffins look delicious, just call them “allspice muffins” and no one will know. Try them again with a different butter as suggested in other comments. I did refrigerate my crumb topping. Also, maybe instead of doubling the recipe, make two batches. Doubling some things don’t work well. Have you made the chocolate chip cookies yet? They will make you feel better. oh no, too bad they didn’t work out for you. Maybe next time?